Hello everyone. I have had quite a boring day here in Rolla Missouri. And I don't want all of you mothers out there saying, "Well if your SO bored why don't you just get of the couch and help me clean up this place! ", because that would not fit the situation. In fact I did clean the house, but sadly to say it wasn't all out of love for my amazing mother. Continue reading Dunn's in debt.. Happy Father's Day everyone. I'm doing some tinkering on the back-end of the website and thought I'd use some pictures from a hike we did last fall as a "test post." 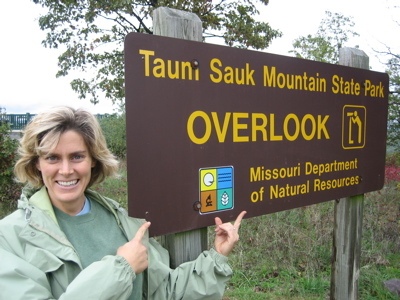 This particular hike was significant as the entire family was able to summit Taum Sauk mountain, the highest point in all of Missouri! Continue reading Taum Sauk Mountain. Well today the Westhoff family had quite a few adventures. Most of them were for the better, but the interesting stuff was for the worst (now you have to read!). We woke up this wonderful Saturday morning as if it was just a regular Saturday morning. And it was. The only difference was that this Saturday morning we were heading over to the Fort (Fort Leonard Wood) to go swimming at the pool there. This pool is well known for its high dive. Its definitely the favorite part of the pool for every one. Sept Lukie, who was having a great time learning to swim. Continue reading Pre Fathers Day, Day. You may have heard of the survival show "Man vs. Wild". That is my favorite show of all time. Its a show that demonstrates different survival tactics in all sorts of different terrains. Bear Grylls (the guy in the show) may not be by him self the whole time. But he does teach me a lot of useful skills. For instance: how to climb (trees, rocks, really big rocks), make fire (in various ways), catch fish, trap game, and how to not puke when eating large grubs... Though I haven't really got the hang of that one... Any way in one of his shows he made himself a repelling harness out of vine in order to climb down a 40 foot water fall. It looked simple enough, so I figured I had nothing better to do that climb up a tree and repel down it. With a rope I found in my garage and using a technique I got off a television show. Continue reading Boy vs. Wild. As all of you may have heard, I have made a lot of progress on my running skills since my last entry dedicated to running (actually it was my fathers, if you'd like to read that search for See Dunn Run). You may remember that great mile marker for me that day.That was the day I made it into the plural mile club. I ran 2 whole miles! Well ever since then (I was about ten... now I'm fourteen) I have made running not only a hobby of mine but also my sport. I am not afraid to "express my greatness" (bragging), so for those of you with low self esteem, please stop reading this article. Continue reading See Me Run. This month Zach and I are doing summer school. Our class is called hip-hop healthy. Emma has a cooking class called: "BAM cooking for cool kids." Well there you go. 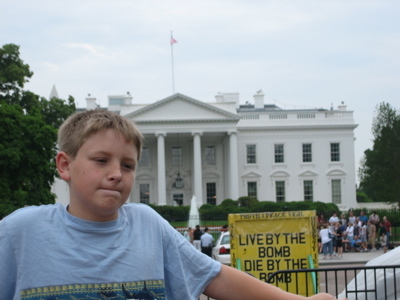 On May 22, 2008 an adventurous trio set out on a six day venture from Rolla Missouri to Washington D.C. I was a member of this historic Trio. My name is John Dunnington Westhoff, but you may know me as Dunn. The other two adventurers were my brother Zach and our father John. They shall be referred to as Zach and Dad. The next few paragraphs you're about to read consist of the happenings of this spectacular six day adventure. Hello to you all, and have a happy Summer. Some of you may not know, especially those wackos that have no relation to the Westhoffs, by either family or friend and yet insist on plaguing the site with their presence anyway, that my dad, Dunn, and I took a vacation to historic Williamsburg and surrounding area, including Jamestown, Yorktown, and Washington D.C. for a week, and this is basically how it went. Continue reading East Coast Trip. This page is a archive of entries in the Chronicles category from June 2008. Chronicles: March 2008 is the previous archive. Chronicles: July 2008 is the next archive.